The 18th edition of FILE – Electronic Language International Festival in São Paulo takes place from 18 July to 3 September 2017 at the Fiesp Cultural Center. 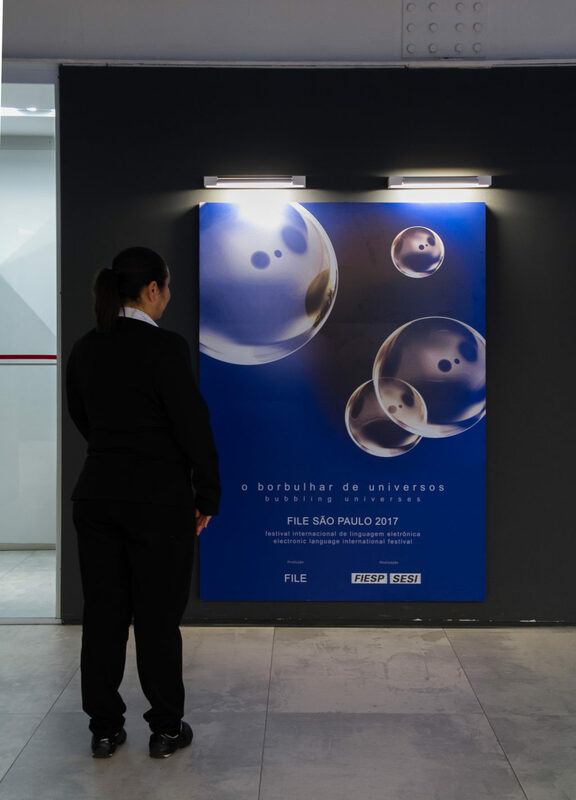 FILE São Paulo 2017: Bubbling Universes occupies many of the spaces, including the Art Gallery, the Digital Art Gallery and the Exhibition Spaces. The Art Gallery houses various interactive and non-interactive installations, as well as virtual reality works, animations, games and GIFs. The Digital Art Gallery is home to the FILE LED Show 2017, a public art display which uses the building’s facade to investigate different forms of artistic expression. From 18 to 30 July, the Exhibition Spaces present a variety of programs, including video art, media art and hypersonic art. Also to be seen are some of the animation works and games, as well as the installation The Flooor, by Håkan Lidbo & Max Björverud. The Exhibition Spaces are also busy from 18 to 21 July with FILE Workshop, a series of workshops and events which examine the creative use of different technologies. Entrance to all the exhibitions and events is free. The emergence of social networks has led to a multiplicity of events on a scale never seen before. The unchecked proliferation of information has now reached an astonishing level and is stored in an unprecedented amount of storage, accessed by thousands of networked data devices. This exponential increase in accessible information overwhelms us all in an incessant and overwhelming flow of concepts, images, opinions and desires. No one is exempt from this cross-contamination, no discipline succeeds in remaining within set boundaries. The proliferation of worlds and tendencies carries us into an indeterminate plurality. All and everything is expanding, like a star in its Red Giant phase, ready to explode at any time. What was immense and infinite has become small when faced with the multiverse. We live in an age of bubbling universes.